Join the fantasy phenomenon that pits Mage against Mage in an epic duel to the death! 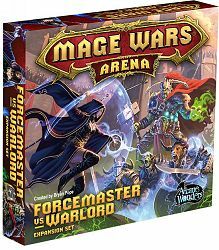 Now play as the Forcemaster – a master of telekinesis and Mind magic, or the Warlord – supreme commander of soldiers and War magic. Build an army of goblin soldiers with the Goblin Builder, Slinger, Grunt, and Bomber! Control the weak willed minds of your enemies with powerful enchantments like Mind Control, Charm, and Force Crush. Build a defensive fortress of conjurations and take over the entire arena with Wall of Pikes, Barracks, Archer’s Watchtower, and Garrison Post! Send in powerful Legendary creatures to finish the job with Iron Golem, Ludwig Boltstorm, Thorg, Sir Corazin, Grimson Deadeye, and more! Control the tides of battle with incredible incantations like Force Bash, Force Wave, Mass Sleep, Earthquake, and Destroy Magic!